Summary: There is an established need in Brevard County for a local sea turtle veterinary facility that can treat both FP and Non-FP stranded turtles. In March of 2012, Brevard Zoo opened a state-of-art veterinary facility staffed by a fulltime veterinarian, vet tech and husbandry staff. With an anticipated opening of October 2013, the Sea Turtle Hospital will include two separate holding facilities that will house FP turtles and non-FP turtles. The FP area will have (3) 8’ diameter tanks and (1) 12’ diameter tank. The non-FP side will have (1) 20’-0” diameter tank, (3) 12’diameter tanks, and (1) 4’ x 8’ rectangular tank. The facility will have two separate closed-loop filtration systems and we will make our own saltwater to supply each tank. Each area will be covered separately by a shade structure. The Sea Turtle Hospital will be staffed by existing Zoo personnel and a full-time turtle husbandry coordinator funded by the local Sea Turtle Preservation Society. There are also long-term plans to partner with Brevard Community College to involve their vet tech students in the sea turtle rehab process. 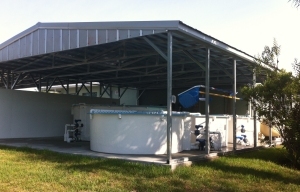 In support of this project we are receiving donated tanks from Marineland, Florida. Results: Brevard Zoo received the final approval for the permits with Brevard County. The facility was built according to the original plans that were created and is now fully operational. The final permit was received on Sunday, April 13th and is enclosed with this report. The first patient at the Sea Turtle Hospital was received on Monday morning, April 14th. Trevor Zachariah, Director of Veterinary Programs, and the rest of his staff are thrilled to be able to provide care to sea turtles in need. Funding was awarded from the Sea Turtle Conservancy for the purposes of creating the Fibropapilloma portion of the facility. In addition to this, Brevard Zoo expended a great deal of money to create a nonfibropapilloma portion of the facility.